“Learn how to write a first manuscript in 60 days using a method developed by Amazon bestselling author, J. Thorn.” Grab the course here. By the end of 2014, J. Thorn will have published over one million words and sold more than 120,000 books worldwide. He is a Top 100 Most Popular Author in Horror, Science Fiction, Action & Adventure and Fantasy (Amazon Author Rank). In March of 2014 Thorn held the #5 position in Horror alongside his childhood idols Dean Koontz and Stephen King (at #4 and #2 respectively). He is an official, active member of the Horror Writers Association and a member of the Great Lakes Association of Horror Writers. J. is a contributor to disinformation and a staff writer for HeavyPlanet. The course details the steps, and mindset, needed to write professionally and get your manuscript done. Because if you can’t finish, then you can’t sell! You have a story inside and yet every day you stare at the keyboard, paralyzed and unsure of how to begin. You’ve tried to get your thoughts organized but you don’t have a strategy, and that leaves you feeling empty and defeated. My name is J. Thorn and there was a time when I didn’t know where to begin either. It can be frustrating trying to organize your project. I know how hollow and helpless that feels because I’ve been there. I can teach you what you need to know in a way you’ll understand, so you’ll be able to finish that manuscript in 60 days and feel like a champion. The hard truth is that to write a novel, you must write. No shortcuts or fancy software will do it for you. If you wanted to get in shape, you’d ask a trainer to teach you a workout. You’d want to learn the process from a professional so you could do it for yourself. A little help with organization and you can do what you thought was impossible. I’ve written more than ten novels and I’m going to share my process with you, which means you’ll feel confident and ready to finish that manuscript. Sure. You could search Google for the best way to write a novel. You’ll get thousands, if not millions, of hits and most of them will contradict each other. Some will be written by people claiming to be authors, yet they’ve never written a single book. You’ll waste countless hours and never get exactly what you need. Over 12 lectures and 37 mins of content! Write the manuscript using a customized workbook to keep track of plot, character and word count. Identify genre-specific word count targets in order to determine optimal length for publication. 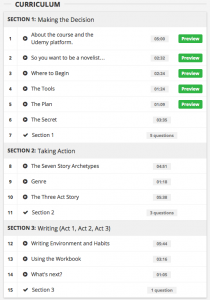 Utilize one of the seven basic story types to create a new novel. Organize the manuscript into three acts. Determine next steps in the publishing process, including editing, formatting and cover design.